The last time I was stuck in an airport with my kids I ended up handing over my iPhone so they could play games and watch movies. I wasn’t the only parent trying to keep their kids busy, and in a very short time there were half a dozen munchkins all trying to watch that teeny tiny screen. The same thing happened camping with friends last summer when a torrential downpour trapped us in our tents for a few hours. 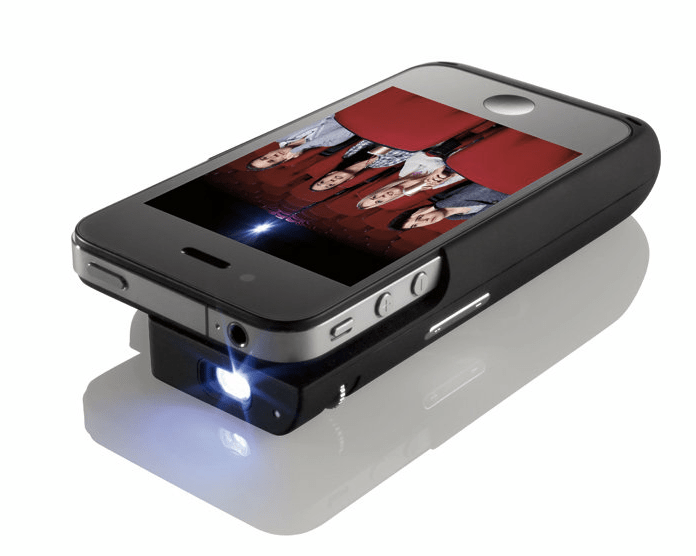 The Brookstone iPhone Pocket Projector is a wonderful solution for those times when you want to use your phone to show video to a crowd. It’s ridiculously easy to use. Simply charge the case-like projector with the USB cable provided, slide your iPhone 4 or 4S into the dock connector and it’s ready to go. The built-in 2100mAh battery means you won’t drain your phone playing video and it even serves as a back-up battery should your phone run low. Although it’ll still fit in your pocket, the unit does add a bit of bulk so it’s not something you want to leave on your phone all the time. Once the projector is on your phone, a simple toggle determines if the unit is being used or if it’s just in stand-by mode. There’s also a little blue light to let you know that the projector is charged and ready to go and if you’re running out of juice, it turns red to give you a warning. A simple thumb wheel is all that’s used to adjust the focus. It was so easy that my kids had it mastered in seconds. As for picture quality, it’s pretty darn good. It has a 15 lumen LED projector that can project images up to 50″ in size. I tried this out and found it to be true, but only in the best possible of circumstances. You need a light or white background that’s smooth and a very dark environment. So, if you use it in a brightly lit area, your quality is going to be slightly less. Still, this isn’t a home theater system, but a projector for your iPhone. In that capacity, it works beautifully. I got a chance to give this a real world test over the weekend on an overnight camping trip with five other families. As the evening wound down the kids started to tucker out, but weren’t quite ready for bed. We piled them in one tent, slipped my phone into the Brookstone Pocket Projector and in minutes they were watching Phineas and Ferb on Netflix on the side of the tent. It was a hit with all the kids — although the other parents may be ready to kill me because now they want one, and the unit isn’t cheap at $229.99. Still, the Brookstone Pocket Projector for iPhone will be worth its weight in gold next time I’m trapped in an airport. This item was provided by the manufacturer for review.